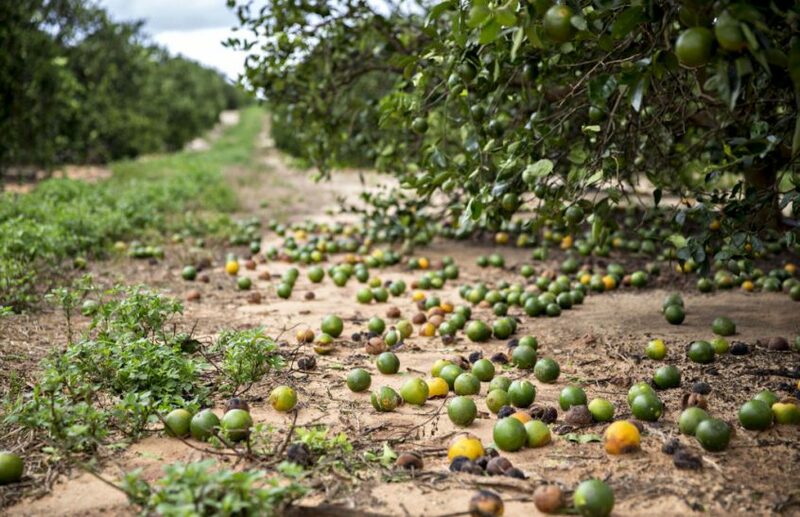 Fallen fruit sits on the ground below orange trees in Frostproof, Florida. 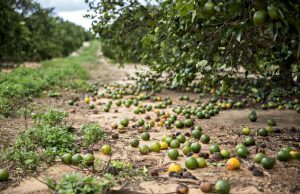 Hurricane Irma destroyed almost half of the state’s citrus crop. (Washington, D.C., May 1, 2018) – Under the direction of President Donald J. Trump, U.S. Secretary of Agriculture Sonny Perdue today announced new details on eligibility for a new U.S. Department of Agriculture (USDA) disaster program, 2017 Wildfires and Hurricanes Indemnity Program (2017 WHIP). Additionally, USDA will provide $340 million through a block grant to the state of Florida for Hurricane Irma losses to citrus production expected during the 2018 through the 2020 crop year, reimbursement for the cost of buying and planting replacement trees – including resetting and grove rehabilitation – and for repair of damages to irrigation systems among other things. In total, USDA’s Farm Service Agency (FSA) will deploy up to $2.36 billion that Congress appropriated through the Bipartisan Budget Act of 2018 to help producers with recovery of their agricultural operations in at least nine states with hurricane damage and states impacted by wildfire. “While no amount of relief can make the farmers who suffered damages from Hurricane Irma whole, this much-needed disaster relief will help Florida agriculture get back on its feet. I thank Secretary Perdue, Governor Scott, our federal leaders and the agriculture industry for their collaborative efforts to provide this relief. Florida’s $120 billion agriculture industry is a pillar of our economy, and we must continue to give our farmers and ranchers the support they need to thrive,” said Commissioner Putnam. Hurricane Recovery: To be eligible a crop, tree, bush or vine must be located in a primary disaster county with either a Presidential declaration or a Secretarial designation due to a 2017 hurricane. Crops, trees, bushes or vines located in other counties may also be eligible if the producer provides documentation the loss was caused by a 2017 hurricane. Wildfire Recovery: Any crop, tree, bush or vine damaged by a 2017 wildfire is eligible. Eligible Producers: Eligibility will be determined on an individual basis, using the level of insurance coverage purchased for 2017 for the total crop acres on the area for which the WHIP application is made. Eligible producers who certify to an average adjusted gross income (AGI) of at least 75 percent derived from farming or ranching, including other agriculture and forestry-based businesses during the tax years 2013, 2014 and 2015, will be eligible for a $900,000 payment limitation with verification. All other eligible producers requesting 2017 WHIP benefits will be subject to a $125,000 payment limitation. Crop Insurance Requirement: Both insured and uninsured producers are eligible to apply for WHIP. However, all producers opting to receive 2017 WHIP payments will be required to purchase crop insurance at the 60% coverage level, or Noninsured Crop Disaster Assistance Program (NAP) at the 60% buy up coverage level if crop insurance is not available. Coverage must be in place for the next two applicable crop years to meet program requirements. Acreage Reporting Requirements: In addition, for the applicable crop years, all producers are required to file an acreage report and report production (if applicable). The WHIP factor ranges from 65 percent to 95 percent. Producers who did not insure their crops in 2017 will receive a 65 percent WHIP Factor. Insured producers, or producers who had NAP, will receive between 70 percent and 95 percent WHIP Factors. Those purchasing higher levels of coverage will receive higher WHIP Factors. Drought, wildfires and other disasters continue to impact farmers and ranchers, and 2017 WHIP is just one of many programs available through USDA to help with recovery. From crop insurance to on-the-ground rehabilitation programs like the Emergency Conservation Program (ECP) and Environmental Quality Incentives Program (EQIP), USDA is here to help. The Bipartisan Budget Act of 2018 provided funding for ECP and the Emergency Watershed Protection Program. The Act also provided amendments to make programs like the Emergency Assistance for Livestock, Honeybees and Farm-raised Fish Program, Tree Assistance Program and Livestock Indemnity Program even more responsive. FSA will hold a sign-up for 2017 WHIP no later than July 16. Additional information on WHIP is available on FSA’s 2017 WHIP webpage. For immediate assistance under any of our other disaster programs, please contact a local USDA service center or learn more at www.fsa.usda.gov/disaster.